When James Kirby vacations at the beach, he looks out at the water and thinks about what’s triggering the break of each wave. Unlike millions of other people who love to watch the surf, Kirby gets paid to think about this passion back at the office and he’s turned it all into award-winning research. 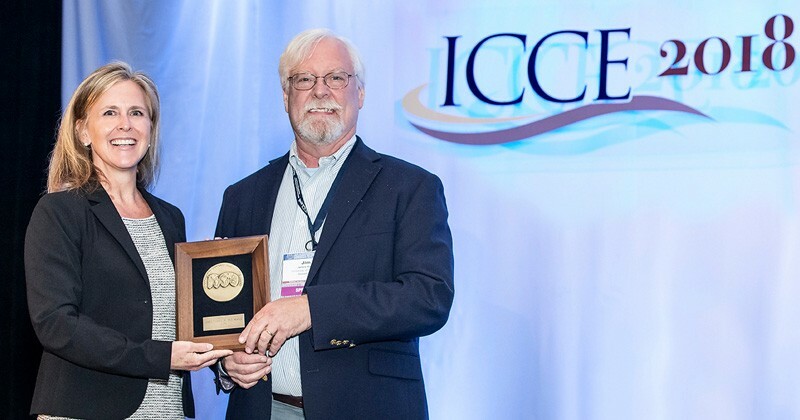 The Edward C. Davis Professor of Civil and Environmental Engineering and professor in the College of Earth, Ocean and the Environment at the University of Delaware, Kirby recently received the 2018 International Coastal Engineering Award from the American Society of Civil Engineers. Kirby develops mathematical models to predict the behavior of waves. His models, including REF/DIF, FUNWAVE, NHWAVE and NearCoM have been utilized extensively by researchers and companies. “They provide an engineering tool to people who do coastal remediation or design harbors, marinas, inlets, and more,” said Kirby. His models are also widely used for hazard analysis, especially in areas affected by tsunamis. Kirby has published more than 130 scholarly journal articles, which have been cited more than 14,000 times. In his most recent article, published in the Journal of Fluid Mechanics, Kirby and collaborators verified emerging research that predicts when waves will break based on a comparison of the speed at which the water particles are moving horizontally, and the speed of the crest of the wave moving forward. When that ratio hits 85 percent, the wave will break. He also continues to study the effects of landslides and tsunamis, research the dynamics of water flow in estuaries and river mouths and study the evolution and resilience of salt marshes. For example, he is trying to describe the waves and wave-driven currents breaking on rocky coastlines. This could help to elucidate how larvae and other organisms living along the shoreline travel out into the sea. It takes many hours of mathematical work and computer programming to develop these models, which have become more complex as computing power has increased over the last four decades. Despite the computational nature of his work, Kirby spends a bit of his work life in the field, too, collecting data on water flow in salt marshes. His passion for fluid mechanics, the study of forces on fluids, began during his undergraduate studies at Brown University. Kirby thought he wanted to be a structural engineer. Kirby earned a master’s degree at Brown, worked for two years at Alden Research Laboratory, and then earned his doctoral degree in UD at 1983. After teaching at Stony Brook University and the University of Florida, he returned to UD in 1989, when he and three colleagues founded UD’s Center for Applied Coastal Research. This research center is devoted to the study of processes at the shoreline and construction within the coastal zone and has served as a training ground for some of the world’s top oceanographers. The other founders of the Center for Applied Coastal Research, Nobushisa Kobayashi, Ib Arne Svendsen and Robert A. Dalrymple, received the International Coastal Engineering Award in 2010, 2005 and 1999, respectively. “This small group has made a major impact on the field,” said Kirby.